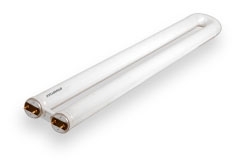 Fluorescent - U-Bent lamp is a type of fluorescent lamp used in both residence and commercial purpose. The lamp is in shape of a U and hence the name. These lamps are mostly used in emergency light fixtures.